It’s been a sad couple of weeks for me here at the farm. My most faithful companion of 11 years, my dog Charley, died two weeks ago Saturday. Still I can barely believe it. Strange but true, this farm and my work today is largely motivated by that colorful, oddball dog. 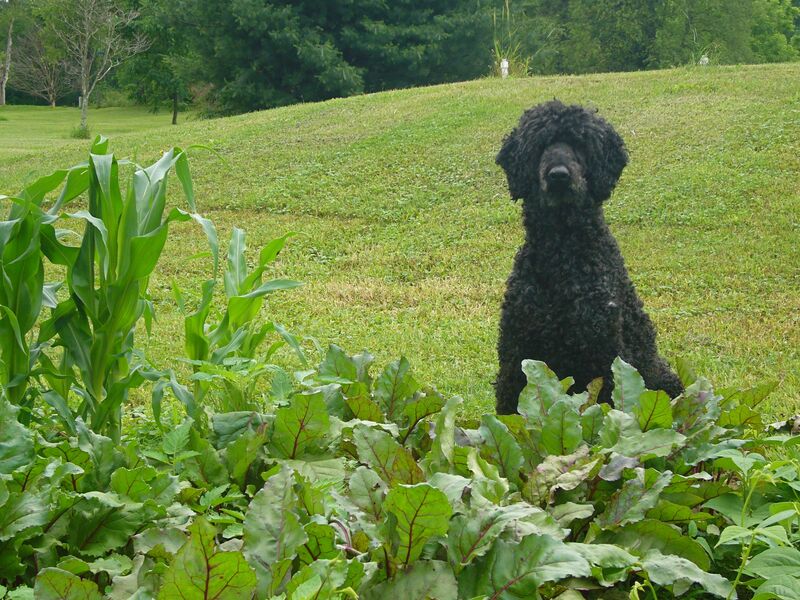 Not your usual farm dog, Charley was a Standard Poodle. These days, Standard Poodles are mostly known for general craziness like goofy haircuts & rainbow dye jobs. Many people are surprised to know that poodles are not French, they’re German. And they weren’t designed to be a canvas for ridiculous fashion, but are actually true working dogs. Water retrievers in fact. Amazingly, the crazy topiary haircut on show poodles today evolved from a practical cut to help lighten the dog for swimming yet still remain warm. Charley wasn’t going for any high-fashion silliness. He was a natural dog with a healthy love of all things stinky. He was the perfect pup, housebroken immediately, not a slipper or table leg chewed, happy to go with you but content at home if he couldn’t, and boy did that dog love food. At first, we couldn’t believe our good fortune. We thought we had escaped all the common puppy mishaps. Then, about the time Charley turned 8 months, he started developing severe, debilitating allergies and skin infections. Out of the blue. Since poodles are prone to a disorder called sebacious adenitus, our vet was a bit too quick to diagnose and sent us home to a messy regimen of nasty oil baths which were hated by both us and Charley. Plus a steady prescription of antibiotics for his constant and smelly bacterial skin infections. Much torture and no improvement continued to the point where we were all giving up. Charley was depressed and showed none of his joy for life, he smelled horrible, had nasty sores and had to wear turtlenecks so he didn’t ooze on anything. He also had to wear a cone much of the time and it was beginning to seem that the kindest thing we could do would be put him out of his misery. We had been to at least three different vets and all reached the same snap diagnoses. I wasn’t ready to give up without one last try, so we found a vet who finally was willing to dig a little deeper. Dr. Hutchinson had colleagues at Cornell who analyzed a skin scraping of Charley’s. Lo and behold, Charley was crawling with Demodex mites. Now, before you get all freaked out, all dogs have these mites and they weren’t any problem for us. Most dogs have a healthy immune system which naturally fights the mites. Charley had no such natural protection and so suffered miserably. This is a genetic issue, and we were guilty of buying a poorly bred puppy from a backyard breeder. Our bargain pup turned out to not be such a bargain. Except we loved him to death and would not have traded him for any other pup, no matter how gleaming and mange free its coat. 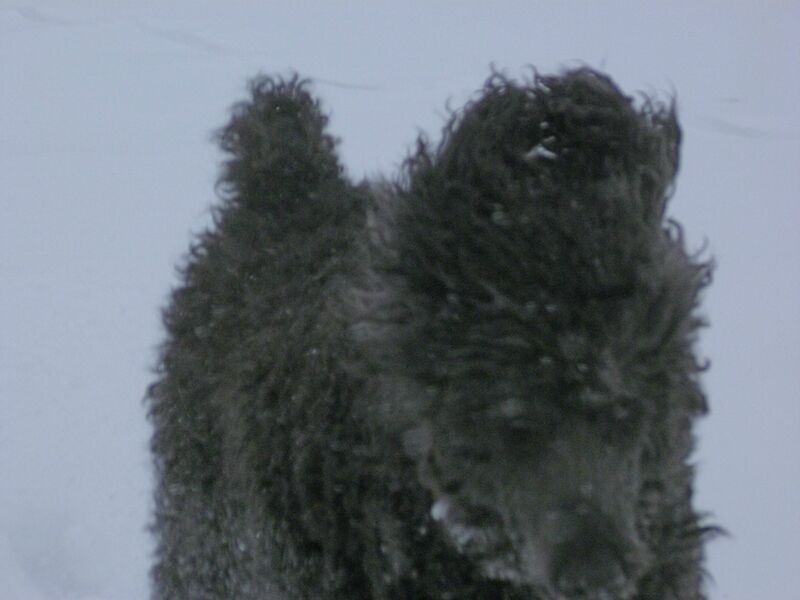 Winter just won't be the same without our crazy-for-snow poodle! Although I felt better to know what we were dealing with, I was still worried since the cure was nearly as bad as the disease. Charley had to take potentially toxic doses of Ivermectin, a type of cattle wormer. To help support his immune system, and to align my dog food purchases with my changing beliefs about buying meat and dairy, I started making all Charley’s food. My research about meat led me to Pet Food Politics by Marion Nestle. I was already bothered by industrial meat and dairy, but now I was disgusted, disillusioned and mad enough to do something about it. I was familiar with the BARF (raw meat) diet, but as much as I loved Charley, I wasn’t going to let him drag raw meat all over the carpets and furniture. OK, maybe Charley wasn’t perfect. He did like to eat on his bed by the living room window. Surely there had to be a win-win compromise! Well, there is. This extremely helpful site from Fiasco Farm has a great recipe for Mable’s Meatloaf. Fiasco Farm features both a meat and vegetarian version as well as valuable dietary information. Charley did the meat version, but the vegetarian may be better for you if your dog suffers from diabetes. The Fiasco Farm site also led me to my pet food bible, Dr. Pitcairn’s Complete Guide to Natural Health for Dogs & Cats. 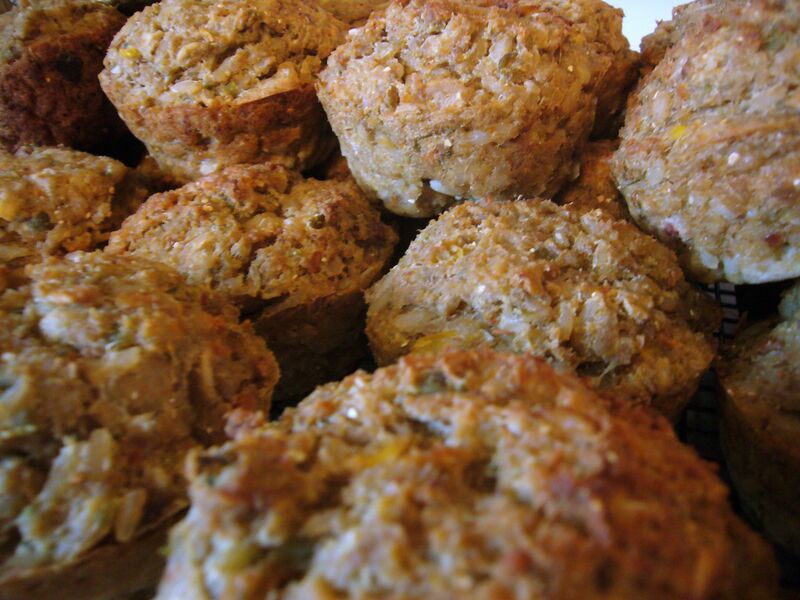 The muffins take a little longer on baking day, but pay you back over and over in ease at meal time! Be prepared to make a slow transition from commercial pet food to home made. Your food is made of only natural ingredients with no additives like stool stiffeners. Be prepared for changes and loosening of your dog's feces while your dog's system adapts. Commercial pet food companies add stiffeners for your benefit, not for your dog's! Fortunately for all of us, the Ivermectin worked for Charley with no ill effects and his bouncy, quirky personality was back. Charley ate commercial dog food only rarely for the rest of his life – he loved his pupcakes. Over time, my original Mabel’s Meatloaf recipe evolved. 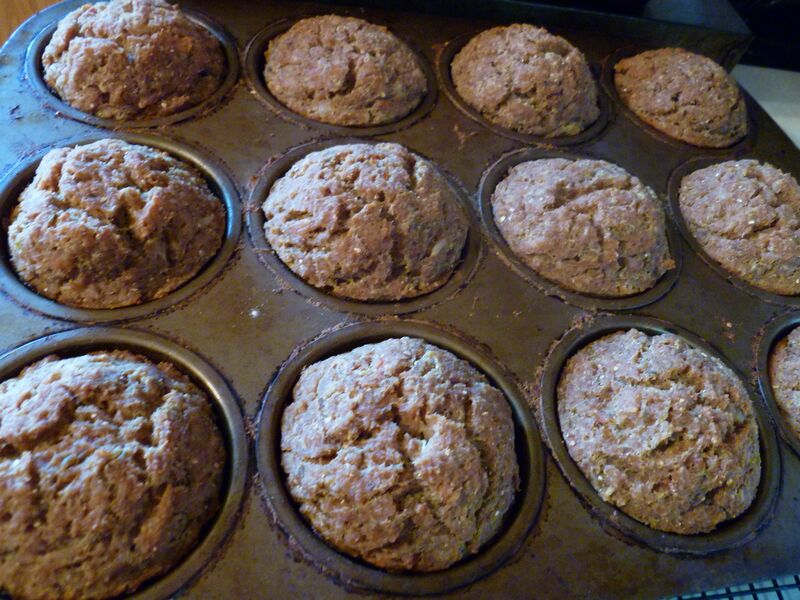 I switched to making the loaf in muffin tins (grease them well) instead of loaf pans which made serving much easier. I would double the recipe which makes approximately 48 (4 tins) of muffins at a time. Exactly the number of muffin pans that fit into my oven at one time. I also would mix and match the grains and meats. And, since Charley went everywhere with me, the pupcakes were easy to pack for travel. What seems like a massive chore really wasn’t hard at all once I got efficient at the process. I was able to work this into my own food preparations with just a little extra effort. I made the pupcakes in bulk and froze them 16 to a gallon sized ziplock freezer bag. Since Charley ate 4 a day, that was just the right amount to thaw in the fridge and finish before they could spoil. I just microwaved 2 pupcakes a serving (just until warm), broke them up in his bowl and that was it. It took some finessing and trial and error to arrive at the perfect quantity per day, but was no harder than figuring out portion control for yourself. Charley, who would eat as much as you would give him and more, was a drama master who could convince you he was starving to death. Once we got past that (he had to get used to doing without a bowl of kibble available during the day), Charley maintained perfect weight throughout his entire adult life. Pupcakes - a tidy, portable, well-balanced diet your dog will love. No more supporting the industrial pet food industry; your dogs can eat the same quality ingredients you do for a fraction of what you'd pay for premium dog food. < Previous In which I wonder: are you kidding me? Loved, adored, and now sorely missed … except by his buddy, Sparky. Now they are together eating pupcakes again which they both enjoyed … thanks to fabulous Mom (to Charley) and GodMom (to Sparky) Jackie. Your heart may be heavy right now; however, I know that it is full and giving. It is because of you that Charley lived fully and enriched our lives along the way. I am so sorry. I have the worst time getting over lost pets. What you did for him was really wonderful.